Since anсient times in Russia skilled women embroidered hand-written icons. Some of Them by overseas beads, and others often by pearls and sawed nacre, flavouring this hand-made miracle with jewels and semi-precious stones. But the misfortune had come, and our monasteries that were a stronghold of Orthodoxy had been closed, brotherhood and sisters had been dispersed, churches had been closed. They tried to destroy our faith as well, but that was above their strength. The faith in God lives in people’s souls – nobody sees it, nobody hears it, but it warms and supports the people deep inside. But the orthodox traditions were seen by everyone, and they destroyed them. The same case with embroidery: who had this skill – had died, and youth had not learned it. Moreover it was dangerous to have this skill in that time. Thus, this ancient skill was gradually forgotten. Unique gift - The beaded icons. But the soul-alive does not have a peace; it wants to express in visible beauty the love to the God it has. And because of this, like stars in the sky, all across the Mother-Russia become to appear native-masters, which revive the lost skill. In various ways. One copies few things, which still exists, someone else has looked at ancient works, and dares to contrive on his own. There is such a person in our city – artist Maria Yantovskaya. She started to embroider a long time ago – more then 30 years ago, in those days when such creativity was dangerous. She also invented own techniques of an embroidery of icons, and then taught the others. And those works, that you can see here, are made by her techniques – every bead is sewn separately, but all together, like the Byzantine mosaic, they form an integral picture. 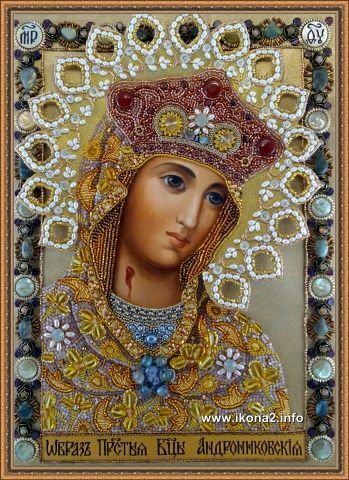 And though these icons are executed strictly on an orthodox canon, nevertheless there is a place for creativity even in its frames – to decorate with stones, or pearls, or amber. So the each icon is a unique one, the only one. But, why I just tell you – you better look …. Ones, at the days of the Christophany there was a king, named Avgar, who lived in Edess - one of Syrian cities on the other side of the Euphrates River. He was suffering from an illness and he had heard about wonderful healings, made by Christ, he wrote to the Savior a letter with an expression of belief in him, as in God who had come from Heavens. He invited the Lord to the capital of his land- Edess, offered him the residence for the sermon of the Word of God and asked to grant him healing and to share the kingdom with him. But the Lord has rejected the invitation, having notified the king that his mission on the Earth was finished and he was going back to The Father and after the revival he promised to send him one of his disciples who would cure him. Then Avgar sent a painter to draw Jesus Christ`s face, but the painter couldn’t do it for it was impossible to endure the wonderful light from the face of the Savior. Because of his philanthropy and not to grieve the prince, the Lord washed his hands, watered his face and put the towel onto it, and the embodied image appeared on the towel. When this image was brought to Avgar, it gave him healing. 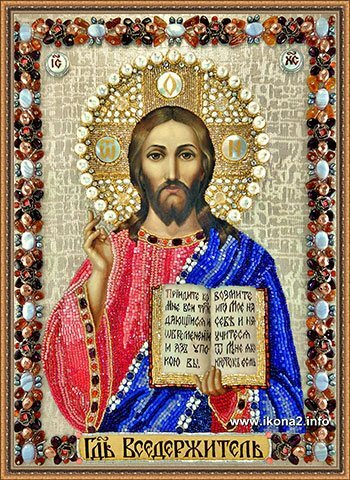 And this image and its replicas ever since are called “the Icon of Our Saviour, Not Made by Hands”. This story happened in 1579. Once the nine-year girl, who lived in Kazan, the daughter of a rifleman, dreamed in her sleep that Mother of God told her, that there was the working wonders icon under the ruins of the burnt house, and she had to dig it out. No one believed the story of girl, but that dream went on and on, and then Matrena herself started to dig out ruins and she actually found the icon. It is remarkable, that the first priest, who took sacred thing from the hands of child, was the Moscow supreme pontiff to be - Ermogen, one of the most famous saints of the Russian Orthodox Church. Soon icon worked the first miracles (healings). Then on the spot it was found the monastery was raised (by the way, in this monastery Matrena afterwards took the veil). In XVII century the copy from the wonder-working Kazan' icon was made for Moscow, and this icon twice saved the capital from the enemies and gave victory to Russians. There are copies of Kazan' icon in Petersburg and in some other cities. Today the existing copies from the Kazan' icon are honored in Moscow, Kazan and Petersburg, and also - Yaroslavl, Vyaznikov, Nizhnelomovskiy, Tobol'skiy, Kaplunovskiy, Tambovskiy, Vysochinovskiy, Vyshenskiy, Bogorodsko-Ufimskiy. In front of the icon of the Mother of God «KAZAN» - they pray for healing blindness, for rescues from the foreign invasions. The icon is the people’s defender in hard times. It blesses couples who going to marry. Days of memory: 8 (21) Jul 22 (4) October. 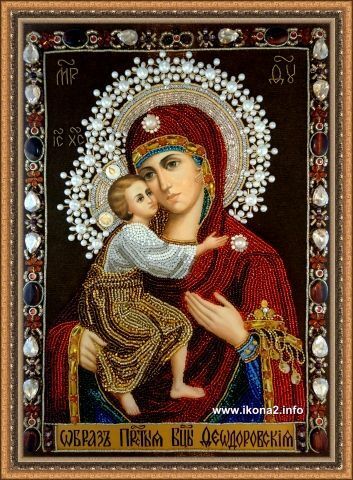 Copyright © 2007-2019 www.ikona2.info - Embroidery of icons with beads and stones.